David Ray Griffin, the "dean of 9/11 studies," has published twelve books exposing the official Big Lie of 9/11. He is the leading scholarly authority on the most important historical event of the 21st century. 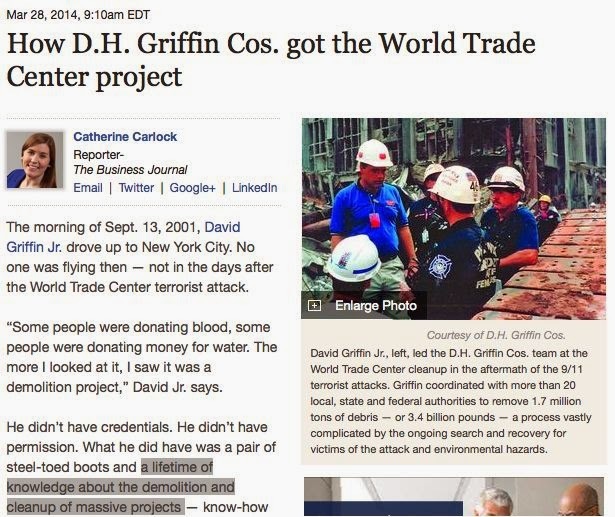 But another David Griffin apparently figured out 9/11 before the famous one did. The morning of Sept. 13, 2001, David Griffin Jr. drove up to New York City. No one was flying then — not in the days after the World Trade Center terrorist attack. “Some people were donating blood, some people were donating money for water. The more I looked at it, I saw it was a demolition project,” David Jr. says. This David Jr. guy figured it out so quick thanks to "a lifetime of knowledge about the demolition and cleanup of massive projects." I emailed David Ray Griffin to let him know that another David Griffin had figured it out first.